As active adult communities go in Central Florida, it’s tough to beat Lake Griffin Harbor. The waterfront setting of this community of manufactured homes for residents 55 and older not only offers splendid views that you’ll never grow tired of, but also an abundance of aquatic activities sure to keep you on the go as much as you want. What’s more, even if you do grow weary of spending time on the water, there are plenty of activities at the resort-style clubhouse and pool to keep you occupied. Indeed, few active adult communities can boast the affordable resort-style living you’ll find at Lake Griffin Harbor in Leesburg. 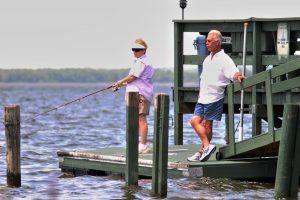 Water lovers can use the community’s boat ramp, marina, and fishing pier to make the most of access to Lake Griffin, a lake that stretches for seven miles and connects boaters to other waterways that ultimately lead to the Atlantic Ocean. For those who would rather relax or work out shore-side, the charming clubhouse complex overlooking the lake includes a large screened-in pool with a whirlpool spa, a fitness center, a banquet hall with a spacious dance floor, game rooms, and outdoor facilities for a variety of sports. There’s also no shortage of places for group meetings, such as our book, painting, and travel clubs. With everything Lake Griffin Harbor has to offer, we’re sure you’ll cross all the other active adult communities off your list once you visit our beautiful community in Central Florida. Contact one of our Lifestyle Consultants today to schedule a tour.